Thank you for supporting LCMS! The Langston Chapel Middle School girls and boys basketball teams would like to thank the Ladies of Zeta Phi Beta Sorority, Incorporated for coming out to support your Blue Devils. Thank you for your service to our community. The LCMS Girls and Boys Basketball Games against South Tatnall have been moved from Thursday, Dec. 20 to Wednesday, Dec. 19. The girls game will begin at 4:30 p.m. and the boys game will follow. The Langston Chapel Middle School Chorus, led by Lawanda Allen, recently performed at the Savannah/Hilton Head International Airport. See the Facebook Live video of our Chorus members singing holiday music! The LCMS Basketball game scheduled for Monday, December 17 against Swainsboro Middle School has been cancelled. See the LCMS Athletics page for the complete schedule of games. Thank you for supporting the LCMS Blue Devils! The Langston Chapel Middle School Girls and Boys Basketball Teams would like to thank the Ladies of Delta Sigma Theta Sorority Incorporated, Xi Eta chapter, as well as the Statesboro Alumnae Chapter and all of the Men of Omega Psi Phi Fraternity Incorporated for coming out and supporting the Blue Devils. Thank you for your service to our community! Free event with parent workshops, community resources expo, activities for kids, & entertainment - Please register online via http://bit.ly/bullochfamilyfiesta or complete a paper registration form from your middle school. Are you interested in technology? Do you have a cool technology project you would like to share? The Bulloch County Tech Fair could be for you! The Bulloch Regional Student Technology Fair takes place on Saturday, January 19, 2019 at Julia P. Bryant Elementary School in Statesboro, Georgia. Visit the Bulloch County Tech Fair website for details and complete the Registration form by December 22 if you would like to enter! The Langston Chapel Middle School Lady Blue Devil Basketball team won the 2018 Langston Chapel Middle School Tip-off tournament championship on November 17, 2018. This is the third consecutive year the LCMS Lady Blue Devils have won their Preseason Tip-off Tournament and the third win in school history. The Langston Chapel Middle School Boys Team also defeated crosstown rival William James Middle School Knights to win the 2018 LCMS Tip-off Classic for the first time in several years. Coach John Roddie was enthused by the way his Blue Devils played, and he is excited about the remainder of the season. Winter Sports Pictures will be taken on November 28, 2018 for Boys and Girls Basketball, Basketball Cheerleading, and Tennis. Order forms will go home with athletes on November 26 or you can order online prior to picture day. Great job to our LCMS students and teachers for being featured on WTOC News! Click here to see the full story! In an effort to assist students, LCMS is offering an after-school program on Tuesdays and Thursdays for grades 6-8. The after-school program will provide all registered students with a snack, tutoring in academic areas, and academic enrichment opportunities. Participation in the after-school program is optional, but highly recommended. Sessions will run from 3:45-5:30 pm on Tuesdays and Thursdays. The tutoring program will work on all academic areas, as well as provide an individualized instruction plan to address student needs. Our academic enrichment opportunities will give students the chance to experience real-world learning projects and activities. If you desire for your child to participate, please complete the attached form and return it to your child’s first period teacher. Tutorial forms must be turned in before a student can begin staying for tutoring. Transportation is provided - see the letter for details. To support teaching of 21st century skills, LCMS has implemented a 1:1 Chromebook program. Students will be issued a specific numbered Chromebook to use as an instructional tool in their academic classes. For 7th & 8th grade, the students will carry their chromebooks in a carrying case to their academic classes and will return them for charging at the end of each day. For 6th grade, students will be issued a chromebook in each of their academic classes, but they will NOT carry the devices from class to class. Students have received digital citizenship instruction and training about chromebook use and care. Chromebooks are only being carried on grade level halls to academic classes (students are not carrying them to lunch or Connections classes). Before a chromebook may be issued, students and parents/guardians are expected to sign a "Chromebook User Agreement" form so that parents and students are aware of the policies and procedures that are in place. If parents/guardians have any questions regarding the 1:1 Chromebook program, please feel free to call the school! "A Century of Valor-WWI 100 Years"
All Veterans, current military, and family are invited to join us as we recognize our own community Military Heroes! "Meet & Greet" - 12:30-1:30 p.m for Veterans from all conflicts and branches of the military. Light refreshments will be served. Program Conducted by LCMS Students; Patriotic Music performed by the LCMS Band & Chorus, & "Teachers with Voices"
All students who were absent on the first picture day or who have enrolled since this day (8/22/18) need to be photographed. Orders information is available at mylifetouch.com. IMPORTANT: RSVP by Thursday, Nov. 1. In order to ensure that we have enough food to serve all that will be in attendance, we need to know how many guests you will be bringing to support your athlete. All athletes will receive a reservation form. Please return the reservation form or call LCMS (912-212-8720) to make your reservation. Dress up, show your spirit, and celebrate being Drug-free! Tuesday 10/23/18 --- Red Day "Extinguish Drugs"
Wednesday 10/24/18 --- Twin Day "Partner up Against Drugs"
Thursday 10/25/18 ---- Team Day "Teaming Up Against Drugs"
Friday 10/26/18 --- Wacky Tacky Day "Drugs are Wacky Tacky "
Monday 10/29/18 --- Camouflage Day "War on Drugs "
Tuesday 10/30/18 ---- Nerd Day "I'm too Smart for Drugs"
Wednesday 10/31/18 ---- Celebrity Day "I'm too Famous for Drugs"
Field trip permission forms must be turned in for students to participate. Support LCMS Athletics this week! See the website calendar and athletic schedules for all athletic events! Please use the Student Parking Lot Gate for Entrance. Are you interested in joining a club at LCMS? Complete this form to get more information about the great clubs and activities available at LCMS! See the slideshow at the bottom of the LCMS Website homepage for pictures from the first LCMS Club Day! You are invited to the Book Fair! Visit the Online Book Fair to shop NOW and to set up eWallet, a digital payment method for students! Athletes will receive order forms or you can click here to order online prior to picture day. Thank you to all of the players who participated in the 1st Annual Ballin' 4 Fun at Langston Chapel. The student athletes and coaches humbly want to thank the volunteers and everyone who came out to support the tournament. We hope to see you back next year for the 2nd Annual Ballin' 4 Fun in 2019. Thanks are in order for Mr. M. Kirkland, Ms. A. Jenkins, and several of LCMS teachers/parents for volunteering their precious time: Mrs. Minus, Ms. Hughes, Mrs. Barrs, Mrs. Goodman, Mr. Roddie, Mr. Wilkey, Mr. Wright thank you all so much. The Higher Groundz team was crowned as the Champion of the 2018 1st Annual Ballin' 4 Fun at Langston Chapel, and Geeked Ent. team was crowned as the Runner-up. Picture order forms will be sent home with all students on Monday, Aug. 20. Order forms and money are due ON PICTURE DAY and should be given directly to the photographer. Payment: Online payment, checks payable to Lifetouch or send the EXACT cash amount (change cannot be made). Students will receive proofs if they do not order on picture day. Parents can order from the proofs but orders must be placed directly with Lifetouch. ONLINE OPTION: Visit my.lifetouch.com and use the Picture Day ID FT758040Q0 to see package information and to order online prior to picture day. The LCMS PTO is selling LCMS spirit apparel! Show your school spirit and support LCMS! Order forms will go home with all students on Monday, August 6. Order forms with payment* are due by August 17, 2018. *Cash or checks payable to LCMS PTO. Langston Chapel Middle School’s Parent Teacher Organization (PTO) invites parents and the community to attend a meet and greet event to welcome the school’s new administrative team on Tuesday, July 24, from 4:30 to 6 p.m., at the school. It’s an opportunity to hear remarks from the new principal and get to know LCMS’s new leaders before school begins on Aug. 1. Light refreshments will be served. Dr. Eric Carlyle began his role as LCMS’s new principal on July 1. Joining him are two new assistant principals, Dr. Kareem Epps and Keith Wright. The new team is working this month to finalize faculty needs and ensure a smooth start to the school year. “I look forward to the opportunity to meet with Langston Chapel staff, parents and community stakeholders to learn more about what they desire and expect from me and better understand what they want to present in their school,” Dr. Carlyle said. Click on the link below for the Summer Workout Schedules for LCMS Football and Basketball. Visit the Cheerleading webpage for the tryout videos. Summer league Girls Basketball at LCMS will start on May 25, 2018 at 3:30pm in the LCMS Gym for interested girls in grades 3-8 who attend Sallie Zetterower Elementary, Mill Creek Elementary, Langston Chapel Elementary, or Langston Chapel Middle school. Contact Coach Reddick at treddick@bullochschools.org for more information. LCMS will NOT have Spring football. Look for information about football in the fall. Order your 2017-2018 LCMS YEARBOOK! The LCMS yearbook is a full-color book with a durable, long-lasting hard cover. It has 64 pages of this year's best memories and the Year-in-Review insert. We will take orders until we sell out! We order a limited number, so don't miss out! Please click on the Registration Link and fill out this information completely. LCMS Spring Sports Banquet - April 26, 2018 @ 6:00 p.m. in the LCMS Cafeteria. Student athletes need to inform the coaches of how many people from your household will attend. Spring Football - May 7-10, 2018. 5th-7th grade student athletes must have a current valid physical on file and must be academically eligible to participate. Contact Randy Cooper at rcooper@bullochschools.org if you have questions. Students must have a completed permission form to attend the assembly. Print attachment, complete, and return to LCMS. Take advantage of an opportunity to represent your school! 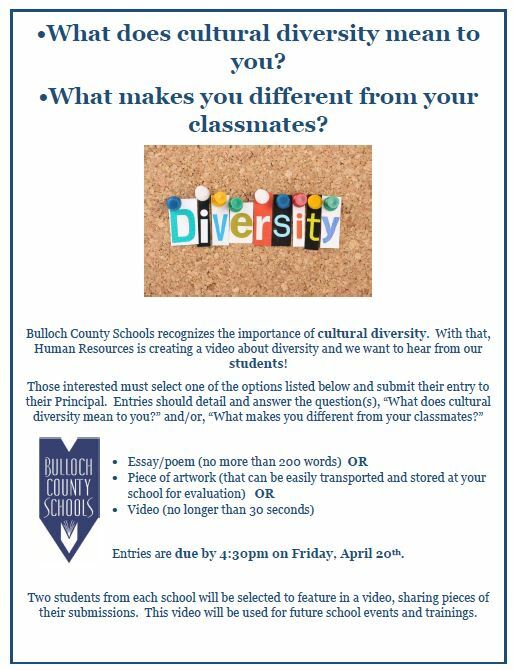 All students are invited to participate in creating an essay, piece of art, or a video about what cultural diversity means to you! See the flyer for details. Two students from each school will be selected to feature in a Bulloch County Schools video! The LCMS Golf Match for Monday, March 19 has been CANCELLED due to inclement weather. The match has been rescheduled for Monday, March 26 at 3:00 p.m. Please take a few moments to answer the following questions. We value your feedback as a parent, school partner and participant in our annual needs assessment process. If your children attend multiple schools, you will need to take the survey more than one time. Responses will be summarized and analyzed in order to plan for the next fiscal year. The estimated time to complete the survey is between 5-10 minutes. Sell Coca-Cola products and WIN PRIZES! March 29: Pick-up Day at LCMS front parking lot from 1:00-4:00 PM. Baseball, Golf, Soccer, & Track pictures will be taken on this day! Congratulations to the Lady Blue Devils Basketball Team! Students need to complete the survey by TUESDAY morning. Come out and support the LCMS Lady Blue Devils in the Region Basketball Championship! Good luck to the Lady Blue Devils! See video below! The 2nd round of the basketball tournament will be on Thursday, January 25 at Effingham County Middle School. Langston Chapel Middle School will be holding the LCMS Annual Tip-Off Basketball Tournament again this year. The tournament will be held November 15-18, 2017 in the LCMS gym. Synovus and Georgia Southern University College of Education (COE) announced another Teacher of the Game winner on Wednesday, Nov. 8, at Langston Chapel Middle School as part of their "Here's to Teachers" campaign. Davis was nominated by a former LCMS student, Chamaurie Jackson, who is now a high school sophomore. In her essay Jackson wrote, "Without Ms. Davis I wouldn’t be as serious as I am about life. She may be a science teacher, but she can teach anyone about life lessons and how to survive." Davis has been inspiring and encouraging students for 26 years, 22 of those in Bulloch County. She's taught eighth-grade Physical Science at LCMS since the school opened in 1998, and this year she began a new role at the school teaching seventh-grade Advanced Science and Learning Lab Math and Reading. Jackson's essay went on to say that "Not only did Ms. Davis speak inspiration but she made science fun and clear. It was the first time I finished the whole year with an A in each 9 weeks. Ms. Davis helped me strive for better and whatever I wanted to do in life, she made me believe it." Davis will be featured on Paulson Stadium's jumbo screen during GA Southern's home football game on Nov. 18, and she and the other four Teacher of the Game winners will also be honored on the field during the game. This last Eagles home game is a special Education Appreciation Day for all educators and COE alumni. Other Teachers of the Game winners from Bulloch County Schools include Jay McNeely of Nevils Elementary School, Simone Lane of William James Middle School, and Talmeshia Parker of Statesboro High School. Pictured: Chad Wiggins and Kim Brannen of Synovus, Tammy Davis and her students, Dr. Tom Koballa, Dean of GA Southern College of Education and John Ramfjord of GA Southern. Attention Students! Are you interested in Technology? Enter the LCMS Technology Fair! Qualify and advance to the Bulloch County Regional Technology Fair on January 20, 2018. Register for the LCMS Tech Fair by Friday, November 17, 2017 in the Media Center. LCMS Tech Fair Qualifier - Dec. 6; projects do NOT have to be complete, but you must have a "work-in-progress" to show. "To Care for Him Who Shall Have Borne the Battle..."
Celebrating the Veterans from all conflicts and branches of military, especially those among us! All Veterans are invited to a Meet & Greet from 12:30-1:30 p.m.; light refreshments will be served. Program includes a "Missing Man Ceremony"
Picture Retakes will be Wednesday, November 1 for all new students and those who were absent on the first picture day. Students who were NOT SATISFIED with their first picture must return the first proof or package in order to have a retake. Order forms are due to the photographer on Retake Day. The LCMS Daddy/Daughter dance has been rescheduled for later in January, 2018. If you have purchased a ticket, your ticket will be honored in January or you can receive a full refund at this time. Please contact Mr. Randy Cooper at rcooper@bullochschools.org if you have questions. Thank you to all of the players who participated in the 1st Annual Clash at the Chapel. The student athletes and coaches humbly want to thank the volunteers and everyone who came out to support the tournament. We hope to see you back next year for the 2nd Annual Clash at the Chapel in 2018. The Claxton team was crowned as the Champion of the 2017 1st Annual Clash at the Chapel, and the Avengers team was crowned as the Runner-up. Students must have an updated Athletic physical on file. PTO is selling LCMS spiritwear! Order forms & money are due in the Media Center by Wednesday, Sept. 27! LCMS Title I Meetings - Tuesday, Sept. 19 from 8:30-9:30 AM or 6:00-7:00 PM (See additional details on website news). Scholastic Book Fair - Sept. 18 - 22, 2017; Open Tuesday, Sept. 19 from 4:00-7:00 for Family Night. Fall Sports pictures will be taken for football, volleyball, softball, and football cheerleading on Thursday, September 7, 2017. Athletes received order forms that should be returned on picture day or parents can order online prior to picture day. See the attached information packets on student accident insurance. Visit the Bulloch County Schools' Back to School Toolkit for important information. See the brochures below for specific information for each grade level. Report Cards can be picked up from LCMS between June 5-7 from 8:00-11:00 AM and 1:00-4:00 PM. We will have a MANDATORY parent/cheerleader meeting on Tuesday, May 23 at 6:00 PM in the LCMS Cafeteria. ALL parents and cheerleaders must attend! Congratulations to the 2017-2018 Cheerleaders! See the lists below for members of each squad. Join us for an orientation about 6th grade at LCMS! Meet the teachers and get your questions answered about middle school! Tryouts are for upcoming 6th-8th Graders interested in Football and/or Basketball Cheerleading. Click here for Online Registration and additional information. The physical form, insurance form, and athletic registration form are due on Friday May 12, 2017 BEFORE tryouts. All forms can be downloaded from the LCMS Athletic webpage.